The video showing an overview of the transmission, presentation, and treatment of Ebola, including some experimental therapies such as ZMapp. Proper infection control practices are also discussed in the video. 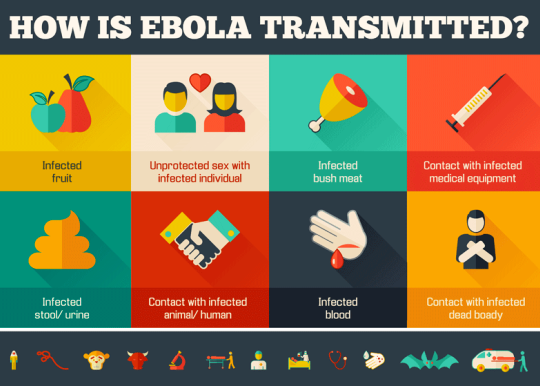 Ebola is not spread through the air, by water, or in general, by food. However, in Africa, Ebola may be spread as a result of handling bushmeat (wild animals hunted for food) and contact with infected bats. There is no evidence that mosquitoes or other insects can transmit Ebola virus. Only a few species of mammals (e.g., humans, bats, monkeys, and apes) have shown the ability to become infected with and spread Ebola virus. Healthcare providers caring for Ebola patients and family and friends in close contact with Ebola patients are at the highest risk of getting sick because they may come in contact with infected blood or body fluids. During outbreaks of Ebola, the disease can spread quickly within healthcare settings (such as a clinic or hospital). Exposure to Ebola can occur in healthcare settings where hospital staff are not wearing appropriate personal protective equipment. Dedicated medical equipment (preferably disposable, when possible) should be used by healthcare personnel providing patient care. Proper cleaning and disposal of instruments, such as needles and syringes, also are important. If instruments are not disposable, they must be sterilised before being used again. Without adequate sterilisation of instruments, virus transmission can continue and amplify an outbreak.